Technology is ever marching forward. Everyone always wants the latest and most up-to-date gadgets and machines. 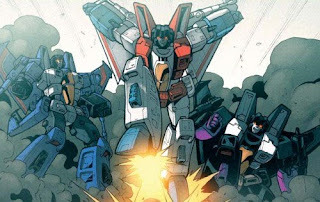 So it’s only natural that when Generation 1 is re-imagined or rebooted, Starscream, Skywarp, and Thundercracker receive alternate modes of the hottest jets in the sky. In the Movie and the IDW comics, this has meant that the Seekers have appeared with the airframes of the United States Air Force’s freshest fighter, the Lockheed Martin/Boeing F-22 Raptor. But longtime G1 Transfans will always have a soft spot for the classic look of the Seekers, the familiar forms that come from air modes derived from the venerable McDonnell Douglas F-15 Eagle. While the Seekers look great and fit well into their F-22 bodies, there is a case to be made for keeping them, for now at least, as F-15s. One of the main reasons given for updating the Seekers’ look is the most basic…an update. Transformers is all about technology, and therefore, it only follows that the elite of the Decepticon air corps should have the newest and best 21st century airframes available. However, Transformers based on the F-22 are nothing new or revolutionary. The first F-22 prototype (then designated the YF-22) took flight on September 29, 1990, and it wasn’t long before the first Transformer based on that airframe appeared. Fearswoop was a European Generation 2 toy that was bright yellow and boasted an impressively large cannon attachment. Released in 1993, this toy was actually preceded in 1992 by the Decepticon Predator Skydive, who was based on the YF-23. 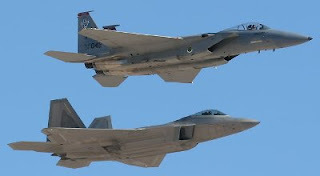 The YF-23 was Northrop’s competing plane that was placed up against the YF-22 in the USAF’s Advanced Tactical Fighter competition for their next generation of fighter. The YF-22 lost out to the eventual Raptor, and has never appeared as a Transformer again since. Later in 1994, the massive Decepticon B-2 Spirit bomber Dreadwing was released, with a little detachable jet named Smokescreen tucked into his aft end. Smokescreen wasn’t an F-22 per se, but some of his lines and design features are borrowed heavily from the jet, if stretched a little out of proportion. The F-22 Transformer would return three years later in the Machine Wars series with Megatron and Megaplex, a pair of toys originally planned for G2, but ultimately cancelled. This mold would be used again the next year in Japan for Beast Wars II Thrust, back in the US for Robots in Disguise in 2001 as Wind Sheer, and as the Robotmaster Air Hunter in 2004. 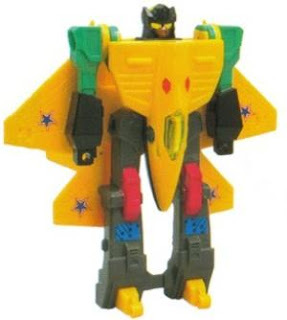 Also in 2004, Starcream was given a ghostly F-22 body in the Energon series, which later got a G1-style repaint the following year. So, by the time IDW had updated the Seekers and premiered them in the Infiltration #0 comic in 2005, the F-22 Transformer already had a twelve year pedigree. Unfortunately, over that extended span of time, the actual F-22 had not fared so well. The usual budgeting and development hold-ups seemed to just build and build, resulting in the first production F-22 Raptor finally being delivered in 2003, with the first operational squadron coming online in December of 2005 after the delivery of the twelfth fighter. At this point, the design was nearly two decades old, and it wouldn’t be long before it would be applied once again to Starscream in the upcoming Transformers live-action film. Released in 2007, the movie also boasted the first on-screen appearance of actual operational Raptors, finally showing their stuff after years in development. So, while considerably newer than the F-15 Eagle, which first flew in 1972, the Raptor is hardly right off of the drawing board. But, as far as Transformers are concerned, what advantages does an F-22 form hold over the F-15 exterior? Not many that I can see. Firstly, if one of the goals is to remain low-key and hidden, the F-15 is a much better choice for a sneaking Decepticon. While no fighter jet is really that inconspicuous, F-15s are considerably more common, with over 1,600 planes having been produced and being operated by four countries worldwide. By contrast, as of July of this year, only 122 Raptors had been built. With plans to keep the F-15s (most notably the 224 F-15E Strike Eagles) flying well past the year 2025, the Eagle will be prowling the skies in force long after the initially planned full production run of 183 Raptors wraps up. Fighter performance is barely an issue. While the Raptor has many advantages in the arenas of maneuverability and stealth capability, just about every airframe advantage is negated by Cybertronian technology, and even that varies from individual to individual. The same goes for avionics and weapons. Arguably, a Decepticon with the body of a German World War II era Me-262 fighter jet can be just as capable as a Decepticon with the alternate form of an X-Wing fighter. In the IDW Movie sequel comics, Starscream seems to gain some sort of ambiguous advantage from his Earth F-22 mode, but exactly what that is, and why remains unclear. There could be some direct correlation between alternate mode and ability in the Movie Universe, but it has yet to be explored or expanded upon. Personally, I’m a huge fan of the F-22 Raptor. It was nearly heartbreaking to watch it languish in budgetary development hell for all those years, and when the United States finally began using them as operational fighters it was great to see these high-tech wonders finally in the skies. But I also have deep and lasting respect for the F-15. A lot of that is due to the Seekers. The original G1 toys were fantastic airplane toys, even if the robots were a little stiff and abstract looking. The F-15 just screams DECEPTICON when seen through a Transfan’s eyes. The jets themselves are pretty awesome on their own. If you’ve ever been on the ramp when one of these warbirds takes to the skies, and you’ve felt the rumble of the engines shaking every cell in your body with over 17,000 pounds of take-off thrust, then you know it’s an almost religious experience. At full military power, they flash through the sky, cutting it with a roar that leaves no doubt as to their might. They truly are great vehicles for Decepticon alternate modes. By the end of IDW’s Devestation story arc, the Seekers were still F-22 Raptors, but by the beginning of All Hail Megatron, which takes place a year after the end of the previous tale, the trio are back in their 1980’s Generation 1 F-15 forms. How and why this has happened has yet to be explained. But hopefully I’ve illustrated several acceptable reasons for why this would have transpired, and it should be interesting to see exactly how the comic writers explain the change. But then again, Transformers are no strangers to change. 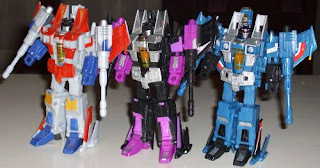 The F-15 versions were also chosen to represent the Seekers for the Classics toyline, and fans took to them warmly, even if a full line-up of the trio is difficult to obtain at best. So, be they F-22 Raptors or F-15 Eagles, or any other of a myriad of aircraft, the Seekers will most probably be with us in the Transformers mythos for a long time to come, and here’s to hoping that the classic F-15 modes continue to endure. Excellent points there. I can only agree, especially about the logic of blending in and the iconic appearance. Very intresting read. With "All Hail" I instantle assumed that Guido made Starscream and the Jets into Eagles in a case of "Must B GEEWUN!!! 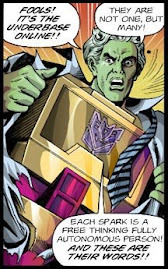 ", since the writer is new to Transformers, he probably wouldn't worry about something quite so trivial. While I still hold to that assumption, at least there is some basis for the change.